BROWNSBURG, Ind. (July 16, 2013) – Ron Capps might have to endure some discomfort when he arrives at Bandimere Speedway near Denver this week for the Mopar Mile-High Nationals, start of the second half of the 2013 NHRA Mello Yello Drag Racing Season. If he is a little uncomfortable when he puts on his NAPA AUTO PARTS firesuit it only would be from a few mosquito bites or a little sunburn. After being the runner-up at the last NHRA Mello Yello Drag Racing Series event at Norwalk, Ohio, Capps headed home near San Diego before whisking his family in their RV up the California coast to Lake Nacimiento near Monterey on the first leg of a two-week vacation. And for the next two weekends he’ll trade his shorts and flip-flops for his NAPA racing gear and driving boots when he flies to Denver for this weekend’s event and a week later to Sonoma, Calif., for the first two stops on the three-event NHRA Western Swing. “It’s our annual vacation and it comes at a great time of year for me,” said Capps, who was born in San Luis Obispo not far from Monterey. “It’s at the halfway point of the season, and it really heats up from here on out. With 13 of 24 Mello Yello events completed, Capps and his NAPA AUTO PARTS team started to make a strong move at Chicago three weeks ago when crew chief Rahn Tobler and assistant John Collins tuned Capps to the No. 1 qualifying spot with a time of 3.988 seconds, which is the quickest Funny Car run of the season. 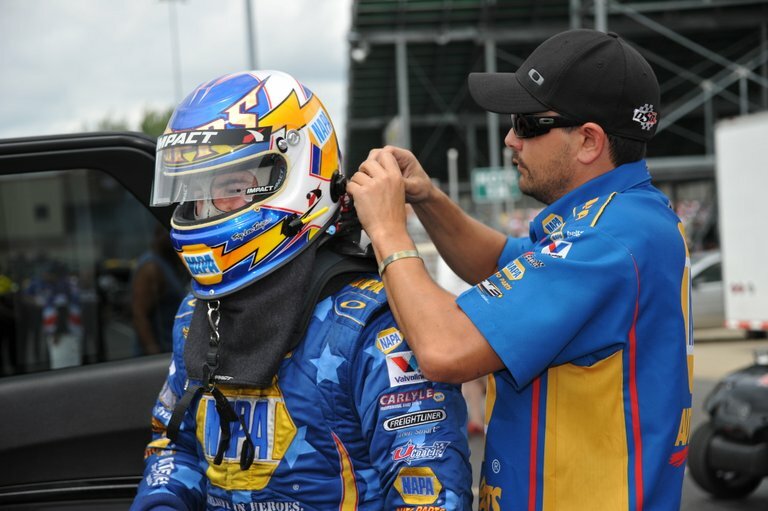 The NAPA team backed that up the following week at Norwalk, Ohio, when Capps qualified third and advanced to his third championship round of the season where he lost to Don Schumacher Racing teammate Johnny Gray. “We had a couple tough races at Bristol (Tenn.) and Epping (N.H.) but our NAPA Dodge Charger looks like its back on course,” said Capps, whose only title this season came in the second event of the season. Those performances moved Capps to fourth in points and just one point out of third, 26 behind Gray in second and 127 behind points leader and DSR teammate Matt Hagan. Join us this weekend at the Mopar Mile-High Nationals in Golden, Colorado. Or cheer on Ron Capps and the NAPA Racing Team at while watching the action on ESPN2. Last event (July 7, Norwalk, Ohio): Qualified No. 3; lost in championship round to Johnny Gray. A year ago at Denver: Qualified No. 3; lost in semifinals to Courtney Force. WEATHER.COM FORECAST FOR BANDIMERE SPEEDWAY, MORRISON, COLO.
July 26-28, Sonoma Nationals, Sonoma, Calif.